• Lotto / Majkowski, Rychlicki, Szpura (PL) double bass + guitar + drums. The fact that we believe in the past is actually a deduction from what we experienced in the present. 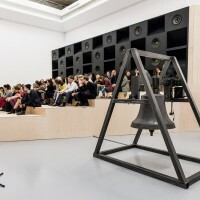 In order to understand the structure and mechanism of Konrad Smoleński’s sound installation and the evolution that it underwent after presentation in the Polish Pavilion in 2013, it is essential to start with the theoretical framework that revealed itself once the machine was designed. The original concept of the project was inspired by the illusory nature of time as defined by Julian Barbour. This British theoretical physicist undermines the significance of time while conjuring up a vision of a timeless universe. One of the principal ideas here is that the present is perceived as a three-dimensional snapshot and the chronological ordering of events is considered a result of nothing more than our memory of individual “nows.” Therefore, time, according to Barbour, is but a sensation of temporality, enhanced by records of what we believe to have existed in the past. In addition to Barbour’s hypotheses, the idea of the exhibition idea has been inspired by a number of other sources, all expressing the inaccuracy or exhaustion of the idea of time. These include science-fiction stories, dissertations on experiments with sound and auditory illusions. This sense of suspended time is also typical of Samuel Beckett for whom the notion of time is one of the key issues, in terms of both text and plot structure. In Beckett’s plays, time is regarded as a persistent factor whose intervals and dimensions, generally known as the past, present and future, merge into one, with time itself becoming, in the words of the playwright, “a monster that both condemns and redeems.” Both Barbour's and Beckett's positions undermine the strictly modernist notion of progress. 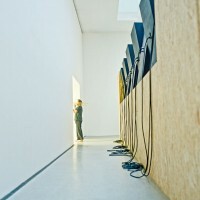 Indeed, they are a radical gesture of the resistance of time and its contemporary economy. 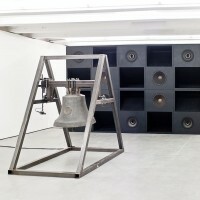 Through the process of transforming this familiar tone of church bells, Smoleński also changes its meaning: a sound that evokes a variety of associations is given an abstract frequency that seems devoid of connotations. Not only does the artist free the sound from its source by recording it in real time and then processing it, but he also resorts to the use of delay and reverberation. 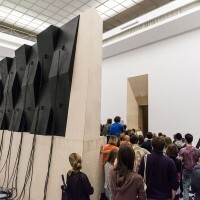 As a result, the enormous speakers retransmit the acoustic waves that accumulate, providing the broadcast sound with a force that affects all persons and objects in its vicinity. It appears that the acoustic signal can move the molecules of both animate and inanimate objects with an equal force. A year after the Venice Biennale the installation has evolved as a project for CentrePasquArt in Biel (6.07-17.08.2014) and Zachęta-National Gallery in Warsaw (10.10-16.11.2014). In each location, the sound sculpture changes to reflect the characteristics of the different spaces, as if adapting to its acoustics like an instrument tuned before a performance. 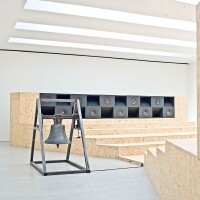 The permanent elements are the two hand-made iron bells and the rows of broadband speakers that echo them. 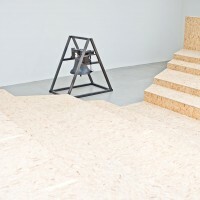 The new addition in the Swiss and Polish versions of the project, Everything Was Forever, Until It Was No More – Time Test, is the vibrating wooden platform that has been designed for the visual and acoustic nature of the space and will serve as a stage for a number of commissioned performances by renowned musicians and composers that started with the collaboration with Mats Gustafsson (in the Polish Pavilion), and being continued with Andrea Belfi and Hilary Jeffrey (in CentrePasquArt). 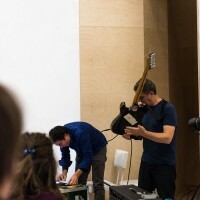 Smoleński also challenges the division between the music and art scenes through the BNNT audio performances, which he and Daniel Szwed have been giving since 2007 in urban public spaces, art institutions and festival venues. 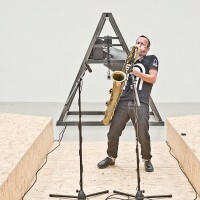 Using their van as an improvised stage, the band performs in balaclavas or masks and each performance involves a sonic attack with the use of a string instrument modeled on the Tomahawk missile (Konrad Smoleński) and a drum set (Daniel Szwed). 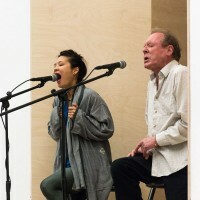 This is an interdisciplinary project involving both public performance — so-called sound bombing — and a publishing activity. All quotations in the text are taken from the exhibition catalogue Everything Was Forever, Until It Was No More, published in 2013 by Zachęta-National Gallery in Warsaw, distributed by Mousse Publishing.